Vernie’s Pizza – One Bite, We Got Ya! One Bite, We Got Ya! Since Vernie's opened in 1998, our goal has been to offer high-quality food and drinks at an affordable price. For nearly two decades - from our first location at the old Triangle Mall, to our current location across the parking lot - we have achieved that goal through the dedication of our staff, our connections with organizations throughout the community, and through the patronage of all of our amazing customers. 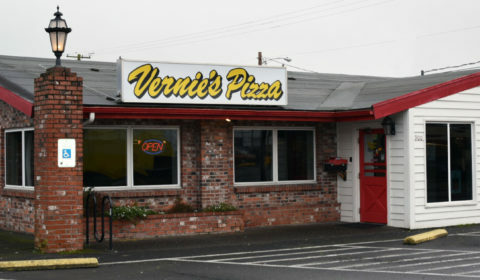 Whether giving back to the community by providing pizza to local schools, businesses, churches, car shows, and charities, or by providing customers with a gathering place where they can eat, drink, and be merry in a comfortable environment, the staff at Vernie's Pizza is honored to reside in and serve everyone from Cowlitz County and beyond!